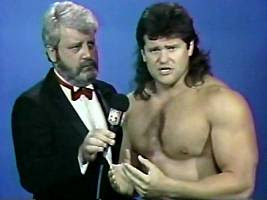 Dave MacWilliams was born May 20th, 1957 in Philadelphia, Pennsylvania. His college career goals totalled 67 with 48 assists in four years on the varsity squad at Philadelphia Textile. He played on the varsity squad of Franklin High School for three years. He was selected to All State and All American high school teams in both junior and senior years. The Rowdies drafted Dave in the first round of the 1979 draft. He was no stranger to the Bay Area, he appeared first in Tampa Stadium, with the Philadelphia Textile Rams in the quarter finals of the NCAA and then in Orlando in the Senior Bowl, where he tallied an assist for the East squad. He was the Ram's second leading scorer in 1978, he drove home 22 goals and 16 assists. Was named second team All American. Dave appeared in 5 indoor games during the 1979 season, but managed to apear in 7 outdoor games, scoring 1 goal. In 1980, Dave signed for his home club, the Philadelphia Fury, he would go onto make 21 appearances and score 4 goals. Dave was a prominent indoor soccer player, starring in the original Major Indoor Soccer League with the Philadelphia Fever, Baltimore Blast, and Chicago Sting. With the Fever, "Mac Attack" was the league's 14th leading scorer in the 1979-80 season, 10th best in 1980-81, and 12th for 1981-82. With the Blast, Dave was the 22nd best scoring in 1982-83 and 13th best for 1983-84. The Blast won the '83-'84 league championship with Dave as captain. He holds the Blast record for play-off games (47) played and play-off points scored (73). Dave MacWilliams has been head coach of the Penn-Jersey Spirit, Baltimore Spirit, and Philadelphia Kixx. He was inducted into the Philadelphia Soccer Hall of Fame in 1998. He is in his seventh year as head coach of the Temple University men's soccer team. He is also Director of Soccer of the Montgomery United S.C. youth soccer club and head coach of the elite U-17 team of the Eastern Pennsylvania Youth Soccer Association. Back Row: Arnie Mausser; Jurgen Stars; Mark Longwell; Perry Van Der Beck; Mark Karpun; Mike Connell; Franz Gerber; Peter Roe. Middle Row: Flemming Lund; Steve Wegerle; Peter Johannson; Pedro DeBrito; Tommy King; Frantz Mathieu; Rodney Marsh (Coach). Front Row: Glenn Myernick; Manny Rojas; Tatu; Gregg Thompson. Eddie Engerth's signed Rowdies card. Tom Boric was born May 11th, 1961 in Croatia, Yugoslavia, and grew up wanting to follow in his father’s footsteps and become a soccer player. When he was 13 years old the family emigrated from Croatia to Canada, settling down in Winnipeg, Manitoba. Tom got a full soccer scholarship to Old Dominion Universiy in Norfolk, Virginia. 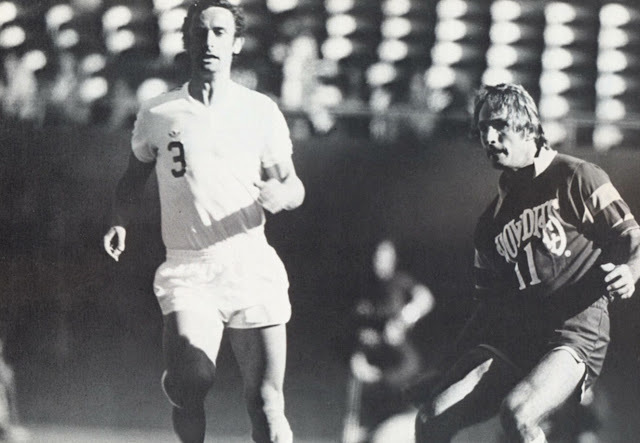 Tom's pre-NASL career included two years at amateur level in his native Winnipeg, before attending Old Dominion, where he was honored with All-Star selection. Tom got drafted to play goalkeeper for the recently formed Calgary Boomers, but never appeared in a first team game. Rehabilitation from shoulder surgery prevented him from joining the Rowdies after the 1981 Boomers dispersal draft, but did join prior to the 1982 outdoor season. Made his official NASL debut on April 24th 1982 against the Toronto Blizzard, allowing only one regulation goal, but losing 1-2 in overtime. He played a total of five games in '82 and appeared to be on his way, before tearing the medial collateral ligament of his right knee against the Ft. Lauderdale Strikers. He spent five months in rehabilitation, only to sprain it during an indoor match. Two more months of rehab followed, before going the distance in 1983, Tommy shared action with Jurgen Stars, playing nine games and registering a 2.62 GAA. Had good games against Team America, Golden Bay Earthquakes, Tulsa Roughnecks and the Strikers, yielding only one goal in each game. was released at the end of the 1983 season, but was re-signed by coach Rodney Marsh prior to the start of the 1984 outdoor season, but only saw action in one game against the Chicago Sting, June 3rd, in a 2-3 loss. After his professional soccer career ended, he began training for a professional wrestling career at a Tampa Bay wrestling school run by Boris Malenko along with his two sons Joe Malenko and Dean Malenko who all had a hand in training him. After training, Tom Boric began wrestling as Paul Diamond in 1985. 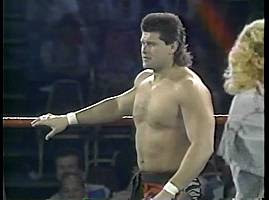 Tom also wrestled for the Texas Wrestling Alliance under the name of Venum (mistakenly listed as ”Venom” in places) , holding the TWA title twice and also being involved in Shawn Michaels return to wrestling after a 1998 back injury that was thought to have put a permanent end to his wrestling career. When TWA and the wrestling academy closed, Tom and his family (wife Lisa and two kids) moved from Tampa to Winnipeg where he opened up a wrestling school called "Paul Diamond Hard Knocks Pro Wrestling Academy". Tom semi-retired from active competition in 2001 to focus on the wrestling academy; his only active involvement in recent years has been Rocket City Wrestling in Huntsville, Alabama, wrestling sometimes twice, as Diamond and as Max Moon while also being involved in the booking. Alan McDonald's signed Rowdies card. Derek Smethurst's signed Rowdies card. 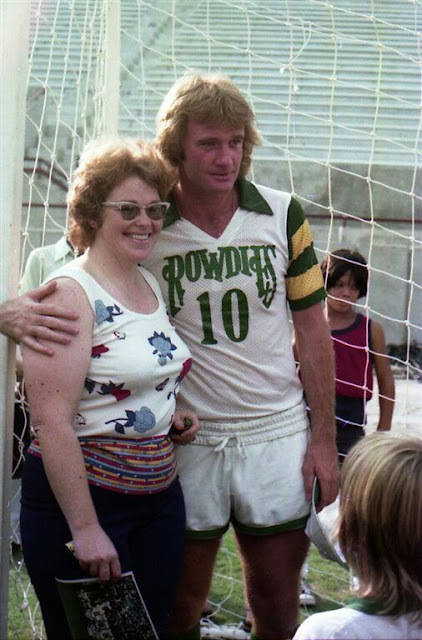 Rodney Marsh, poses with a fan, at a Rowdies Fan Day in 1976. Many thanks to Dan Perez. John Bluem was born April 17th, 1953 in Syracuse, New York. He was drafted in the fourth round from Hartwick College, Oneonta, NY. Eddie Firmani said at the time, "raw talent." Had an uncompromising attitude towards the game, he used natural athletic ability to compensate for his late start in the sport. Was a member of the 1975 indoor team, but with sheer determination and durability made the '75 outdoor squad. 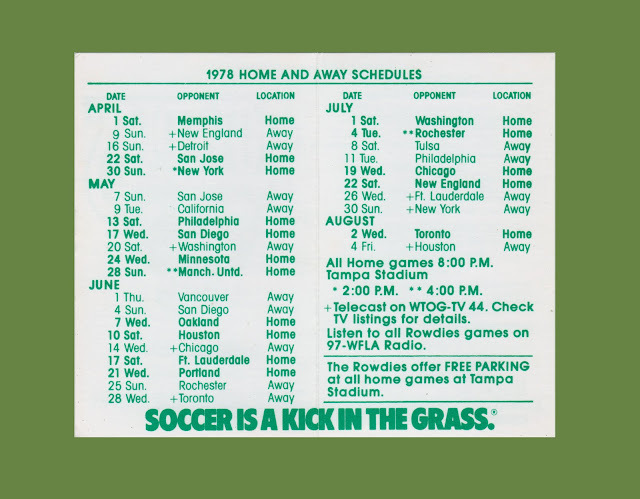 Started in the opening game of '75, in a 2-1 win against the Rochester Lancers at Tampa Stadium, April 26th. Would also make a substitute appearance against the Washington Diplomats, May, 9th during the 1975 season. 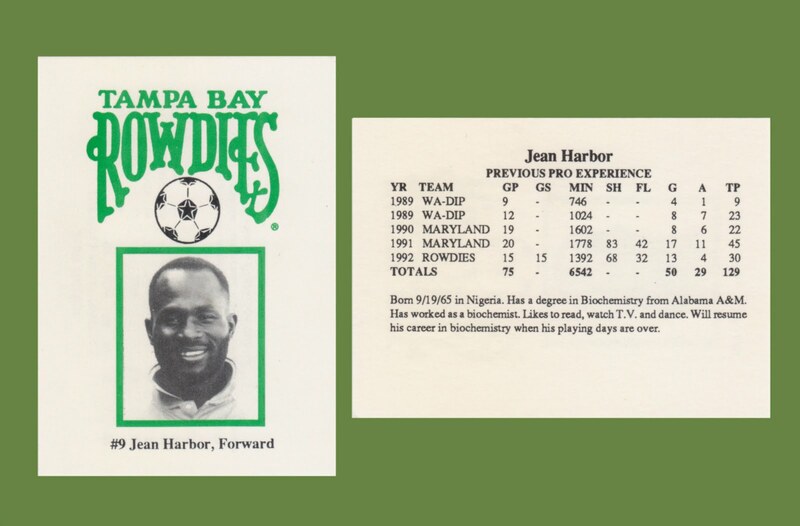 Played right-back during the 1976 Haitian tour and was part of the 1976 NASL indoor Tournament Championship. Would appear in 13 games during '76. After his playing career, he became one of the sports highly rated coaches. 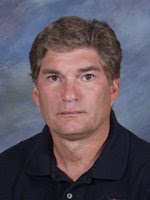 John earned his master of arts in physical education from the University of Akron in 1984. He received his bachelor of science in secondary education from Ohio State in 1980 after completing a bachelor of arts degree in history from Hartwick College in 1975. In 1996, at Fresno State, John averaged 14 wins per season and qualified for NCAA postseason play in four of his six years as mentor. His squad posted a 17-5-1 record, won the first Western Athletic Conference title and advanced to the quarterfinals of the NCAA tournament, ending the season with a No. 7 national ranking. In 1997, he became the ninth head soccer coach at Ohio State and wasted no time in recharging the Scarlet and Gray program. He guided one of the youngest teams in school history to an 11-7-2 (3-1-1 in Big Ten) record and the Buckeyes made it to the championship game of the Big Ten tournament for the first time, coming away with a runner-up finish. In 1999, John guided the Buckeyes to an 11-8-0 record and a second-place regular season tie with Penn State in the Big Ten at 3-2. The winning ways of 1999 erased an 8-9-3 finish in 1998, when Ohio State finished third in the regular-season standings. Senior goalkeeper Jon Lowery, who had been the Buckeyes’ first first-team All-Big Ten selection, repeated the honor along with three of his teammates. The 2000 campaign was one of many firsts for OSU soccer—its first Top 25 national ranking, first Big Ten championship and first trip to the NCAA tournament. Ohio State was ranked as high as No. 12 in the NSCAA Top 25 poll and No. 1 in the NSCAA Great Lakes region poll, landing a spot among the Top 25 for an impressive seven consecutive weeks and finished the year at No. 18. The Buckeyes finished 12-5-4 overall and earned Ohio Team of the Year accolades. In 2001, the Buckeyes earned their second-consecutive bid to the NCAA tournament with their first-ever at-large berth as OSU finished with a 10-7-2 overall record. That season he also led his team to its then-highest ranking in program history, a No. 10 ranking in the NSCAA poll. The 2002 season also was highlighted by a prestigious personal achievement for him, John was inducted into the Hartwick College Hall of Fame. A starting stopper for Hartwick from 1972-74, he helped the Hawks compile a 30-9-7 overall record and make three trips to the NCAA tournament, including a third-place finish in 1974. In 2002, his Buckeyes narrowly missed what would have been their third-consecutive trip to the NCAA tournament. Ohio State went 11-7-1 overall and 3-3 in the Big Ten. The season was highlighted by a six-game winning streak, while six of OSU’s seven losses were decided by just one goal. The 2004 season was one of Ohio State’s best in the 56 years of the program. The Buckeyes won a share of the Big Ten regular-season title with a 5-1-0 record and went three rounds deep in the NCAA tournament, hosting and beating No. 11 Memphis in the first round and winning at No. 9 Notre Dame in the second round. In the MLS supplemental draft, Big Ten Player of the Year Justin Cook was selected by Chicago and teammate Sammy Tamporello was picked by Dallas. In 2005, the Buckeyes were 11-8-2 overall and finished second in the Big Ten regular-season standings, ahead of two-time defending national champion Indiana. Ohio State was sent to No. 18 Santa Clara for the first round of the NCAA tournament, where the Buckeyes’ season ended with a hard-fought 1-0 loss. During the season, OSU was ranked as high as No. 11 in the nation and No. 3 in the region. John’s 2006 Ohio State squad finished with a final RPI of No. 28 and advanced to the Big Ten championship game, but the Buckeyes were surprisingly not selected for the NCAA tournament. As usual, he had Ohio State playing its best soccer at the end of the season, as the Buckeyes went 8-2-1 in their last 11 games on their way to the league title game at home in Jesse Owens Memorial Stadium. Today, John is in his 11 season as Head Coach at Ohio State, and lives in Columbus with his wife, Bethany, son, William, 19, and daughter, Amy, 16. Gavin Maguire's signed Rowdies card. Lenny Glover against the Cosmos' Dimitrijevic in 1977. 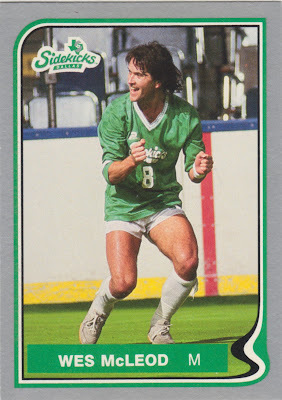 Terry Rowe's 1987-88 MISL card, produced by Pacific Trading Cards, whilst at the Wichita Wings. Left to Right: Winston DuBose; Peter Gruber; Refik Kozic; Peter Roe; Zequinha; Njego Pesa; John Gorman; Mike Connell; Carl Bennett; Hugo Perez; Neill Roberts; Washington Olivera; Keith Bailey; Jurgen Stars. Thanks again to Jan Reinertsen for the photo. This is part of my Rowdies pocket schedules collection, pictured is the front and back of the 1978 schedule. The center of the schedule. Julio “Ringo” Cantillo was born May 21st, 1956 in Costa Rica. He began his professional soccer career with the Cincinnati Comets of the American Soccer League in 1972. Ringo was only 17 years old, but quickly established himself as among the most talented players in the league when he won MVP honors as a rookie. The Comets also won the the league championship that season. He earned MVP honors in 1974 and in 1975 was a first team All Star. At the end of the 1975 season, the Rowdies signed him from the Comets. He played a single season 1976, twenty-one games in total, with Tampa Bay before returning to the ASL, this time signing with the New Jersey Americans. Ringo was part of the ASL’s most exciting team as the Americans played a free flowing attacking game which took them to the 1977 championship. He was again the league MVP, his third in five years in the ASL, and a first team All Star. Ringo jumped leagues again at the end of the 1977 season. He joined the New England Tea Men. He would remain with this team in its various incarnations until 1985, except for 1983 when he played for Team America. The Tea Men spent the 1978-1980 seasons in New England before moving to Jacksonville, Florida at the end of the 1980 season. He moved with the team and played the 1981 and 1982 seasons with Jacksonville. In 1983, he signed with Team America. However, the team stumbled to a 10-20 record and the bottom of the league standings and USSF pulled the national team from the NASL at the end of the season. He returned to the Tea Men for the 1984 season, but the team had left the NASL at the end of the 1982 season to join the United Soccer League. Ringo and the Tea Men began the 1985 season with the USL, but the team and the league collapsed after only six games. He also played one season in the Major Indoor Soccer League. Ringo earned eleven caps with the U.S. national soccer team between 1979 and 1982. Ironically, although part of Team America in 1983 he was never called up for the U.S. games that year. he played his first game with the U.S. in its only 1979 match, a 3-1 win over Barbados. He played his last game on March 21st, 1982 in a 2-1 win over Trinidad and Tobago. Today, Ringo is living in Jacksonville, Florida. 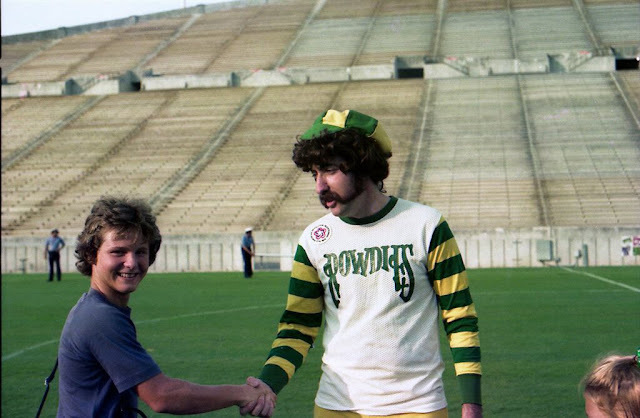 Ralph Rowdie, shakes a fans' hand, at a Rowdies Fan Day in 1976. Keith Peacock was born in Barnehurst, Kent, England, on the 2nd May, 1945. Keith played his entire professional career for Charlton Athletic, making over 500 Football League appearances between 1962 and 1979. On August 21st, 1965, while playing for Charlton, he became the first substitute ever to be used in the Football League when he replaced injured goalkeeper Mike Rose after 11 minutes of an away match against Bolton Wanderers. In 1979, he became Player/Assistant Coach with the Columbus Magic in the ASL, then his old friend Gordon Jago asked him to become his assistant, in a role which would last until 1982. Keith also made 2 appearances during the 1980-81 indoor season. 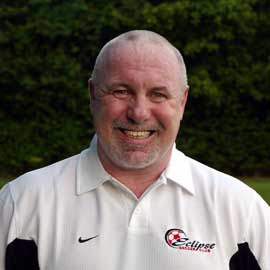 Keith was manager of Gillingham between 1981 and 1987 and then Maidstone United between 1989 and 1991. He later served as assistant manager at Charlton Athletic before stepping down after the resignation of Alan Curbishley in 2006. He moved to West Ham United where he became first a scout and then assistant manager under Alan Pardew and Alan Curbishley. He ended this role at the end of the 2006–07 season. 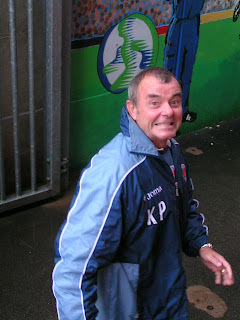 In September 2007 Keith returned to Charlton Athletic in the role of honorary associate director. Keith, married to Lesley and has a son, Gavin (born 1967), who also became a professional footballer, and a daughter, Lauren. A signed card by the late Charlie McCully who guested for the Rowdies on a 1976 Tour of Haiti. 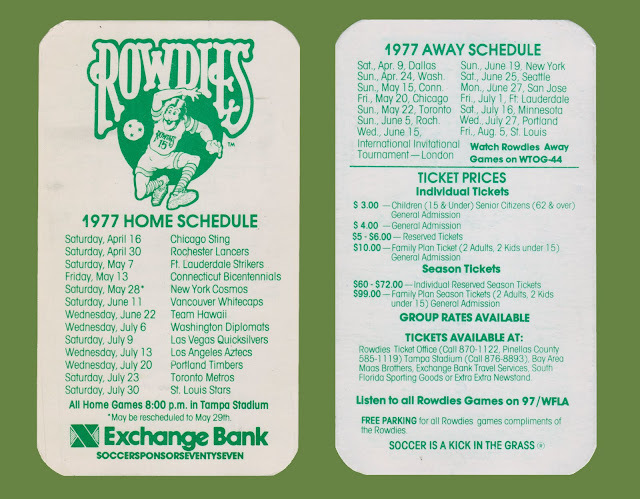 This is part of my Rowdies pocket schedules collection, pictured is the front and back of the 1977 schedule. Back Row: Gordon Jago (Coach); Winston DuBose; Peter Anderson; Dave Taber; Neill Roberts; Perry Van Der Beck; Petar Baralic; Paul Mott; Kevin Clinton; Keith Peacock (Asst. Coach). Middle Row: Ted Buxton (Scout); Alfredo Beronda (Equipment Manager); Keith Bailey; Wes McLeod; Farrukh Quraishi; Steve Wegerle; Oscar Fabbiani; John Gorman; Ken Schields (Trainer). Front Row: Peter Chandler; Manny Andruszewski; Jan Van Der Veen; Mike Connell; Refik Kozic. Paul Hammond was born July 26th, 1953 in Nottingham, England. On January 13th, 1971, Paul signed as an apprentice with English First Division club Crystal Palace. He remained on the Palace youth team until first team keeper, John Jackson was injured in 1972. While Paul, then became the starting keeper, his inexperience was a contributing factor to Palace’s slide to the second division, then third division. In the midst of Palace’s free fall through the English leagues, the team loaned him to the Rowdies for off-season training. The new owners hired Eddie Firmani, an assistant with Palace, as the team’s first head coach. Firmani brought over three Palace players, Stewart Jump, Mark Lindsay and Hammond for the 1975 season. He had to share the goalkeeper's postion with Mike Hewitt. Amazingly, the Rowdies won the league championship that season. However, he returned to Palace at the completion of the loan and was replaced by U.S. great Arnie Mausser for the 1976 season. 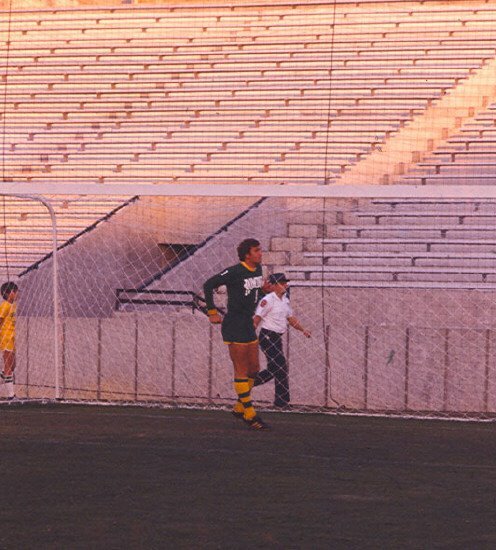 Although Mausser had been capped by the U.S. national team, and was selected as the top NASL goalkeeper for 1976, Firmani preferred Hammond and negotiated his purchase from Palace. At this time Palace was attempting to rebuild its team and used the funds from Paul's sale to purchase striker Jeff Bourne from Derby County. 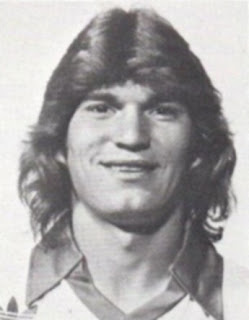 Paul played with the Rowdies through the 1977 season, but was traded to the Houston Hurricane after only eight games of the 1978 season. 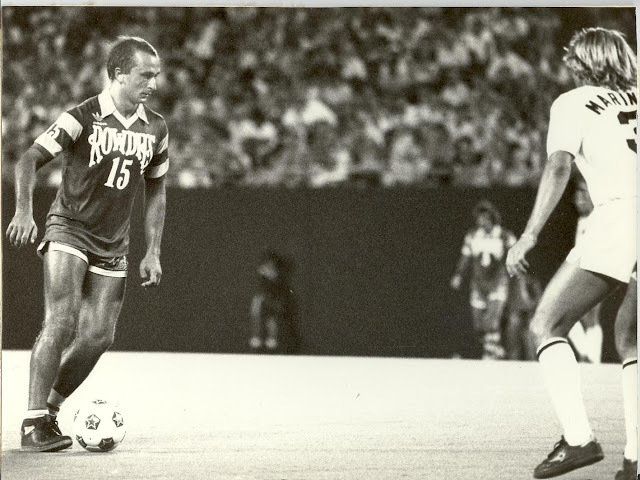 He then spent the 1979 and 1980 seasons in Houston, being named to the NASL second team All Star list in 1979. While in Houston, he was introduced to professional indoor soccer when a new league, the Major Indoor Soccer League began operations in 1978-1979. He played for the Houston Summit Soccer which drew many of its players from the NASL Hurricane. Hammond was selected as the Goalkeeper of the Year as the Summit ran to the best record only to fall to the champion New York Arrows in the playoff semifinals. At the end of the1980 season, the Hurricane folded and Hammond went to the Seattle Sounders in a dispersal sale. By this time he had blossomed into an excellent keeper. In 1982, the Sounders went to the championship game, only to fall to the New York Cosmos by a score of 1-0. That year he was ranked as the third best keeper in the league. At the end of the season, he entered contract negotiations with the Sounders. However, other opportunities beckoned. He had gained his U.S. citizenship and the United States Soccer Federation had decided to enter the U.S. national team into the NASL. The team, fittingly known as Team America, drew on U.S. citizens playing in the NASL, MISL and the American Soccer League. However, many U.S. players were unwilling to leave their professional teams to play full time for the national team. To make up a full roster, USSF allowed a limited number of non-U.S. citizens, such as Alan Green to join Team America. Hammond elected to leave the Sounders after they failed to meet his demands and signed with Team America. When Team America finished the 1983 season with a 10-20 record, the worst in the NASL, USSF withdrew the team from the league. At that point Paul moved to the Toronto Blizzard for the last season of the NASL. In 1984, he achieved his greatest success in the NASL when he had the lowest goals against average in the league. That gained him another Second Team All Star team selection. He remained with the Blizzard for the 1985 season, which they played in the National Soccer League of Canada. Today, Paul lives in Mississauga, Ontario, Canada. Frank Worthington and Luis Fernando celebrate a goal against the Atlanta Chiefs in 1981. Donald "Don" McAllister was born 26th May, 1953 in Radcliffe, Manchester, England. He Started his career with local second division side Bolton Wanderers as an apprentice in 1968. Making his full debut at the age of 16 in 1969. He played 170 games for Bolton between 1969 and 1975, when he was transfered to Tottenham Hotspur at the age of 21. While with Spurs, he went on loan to the Washington Diplomats in 1977 making 24 appearances. Don played a total of 210 games for Tottenham, including the FA Cup in 1981. In 1982, he moved to second division side Charlton Athletic, where he notched up 55 games and scored 6 goals. In 1983, went to America on a free transfer, in the September, Don and a friend opened a candy import business in Orlando called McNiblack and Co., and he made the Rowdies team as a walk-on trialist. He signed two weeks before the start of the '84 season. Sadly, due to financial reasons within the Rowdies organization he made only one substitute appearance against the Minnesota Strikers in the season opener at Tampa Stadium in a 1-2 loss, before joining Portugese side Vitoria Setubal. Then in the 1984-85 season He finished his first class career at Rochdale in England to make a further three appearances. Today, Don McAllister has emigrated to Sydney, Australia, where he now works as a finance manager. 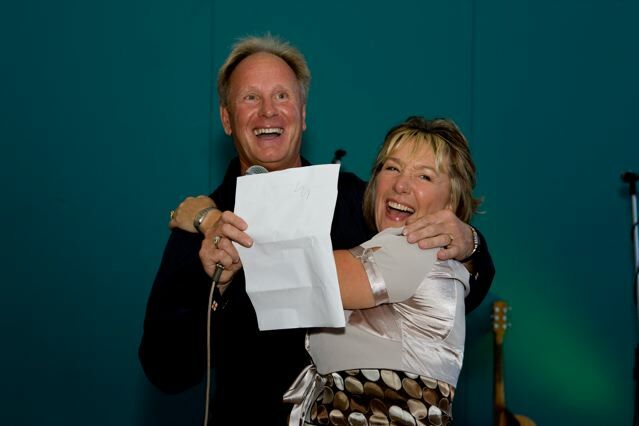 Pictured here with his wife Linda at their daughter's wedding. Soon to be grand parents. Congratulations!! Thanks to Don for an excellent photo. Back Row: Gordon Jago (Coach); Zeljko Bilecki; Arsene Auguste; Perry Van Der Beck; Barry Kitchener; Mojas Radonjic; Peter Chandler; Manny Andruszewski; Winston DuBose. Middle Row: Alfredo Beronda (Equipment Manager); Mike Connell; Steve Wegerle; Farrukh Quraishi; Dave MacWilliams; Wes McCleod; Oscar Fabbiani; Ken Schields (Trainer). Front Row: Sandje Ivanchukov; Petar Baralic; John Gorman; Rodney Marsh; Jan Van Der Veen; Ivan "John" Grnja; Peter Anderson. David Nedjate "Dave" Mehmet was born in Camberwell, England, on 2nd December, 1960, of Turkish extraction. The red headed midfielder started his career under Coach Gordon Jago at second division Millwall. Before that Dave Represented Blackheathe and Inner London, which helped him become an associated schoolboy at 15 years of age. He became an apprentice at 16 and then became a full professional on his seventeenth birthday in December 1977. A goalscorer in the Football Association Youth Cup Championship team of 1978-79, a youth internation, he was selected for the England Youth vs. Norway in 1978. In 1981, after 114 games and 5 goals he joined the Rowdies, making 15 appreances and scoring 3 goals. This was to be his only season with the Rowdies, before signing with Charlton Athletic for the 1982-83 season. The following season, would see him move to Gillingham where he would go onto make 132 apperances and scoring 39 goals. 1986 saw him return to his first club Millwall, where he would end his League career in 1988. He would then go onto play non-league football with a number of clubs: 1988-89 Fisher Athletic, 1989 Maidstone United, 1989 Alma Swanley, 1989 Barnet, 1989 Enfield, 1989 - 1991 Fisher Athletic, 1991 Alma Swanley, 1991 - 1993 Erith & Belvedere, 1993 - 1995 Fisher Athletic, 1995-96 Erith & Belvedere, 1996 Bromley, 1996 Erith & Belvedere, 1996 - 1999 Greenwich Borough and finally Stansfeld O & BC. at the age of 40 years of age. 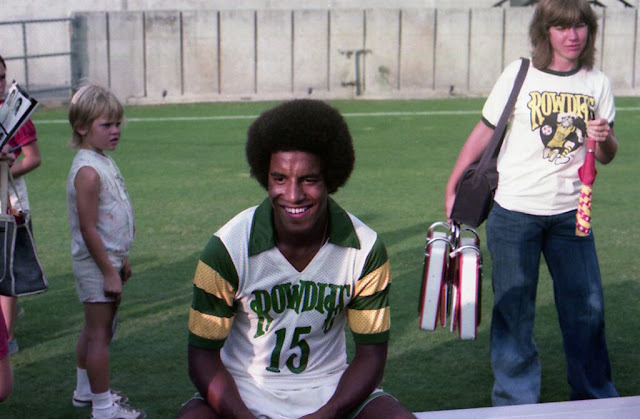 Mark Lindsay, at a Rowdies Fan Day in 1976. Kevin Damien Keelan MBE was born 5th January, 1941 in Calcutta, India. Kevin signed for Norwich City from Wrexham in July 1963 and would later be described by his manager at the time Ron Ashman as "The bargain of the century." In total, he played 673 competitive matches for Norwich. It remains the club record to this day and is a record that is unlikely to ever be beaten. His first match for the club was on 24th August, 1963 in a 3-1 defeat at Cardiff City. His final appearance for the club was on 9th February, 1980 in one of the most extraordinary matches that Carrow Road has ever seen, which ended in a 5-3 win for Liverpool. Because he was with Norwich City from 1963 through to 1980, he was part of some of the major events in the history of the club - the 1971-72 season that saw Norwich promoted to English football's top division for the first time, the League Cup final of 1973 against Tottenham Hotspur which was the club's first appearance at Wembley Stadium, another League Cup final against Aston Villa in 1975, as well as relegation from division one in 1974 and promotion again in 1975. In the 1975 League Cup Final he became the first goalkeeper to save a penalty at Wembley when he saved Ray Graydon's spot kick. Unfortunately, Graydon followed up the save to score the only goal of the game. He was twice voted Norwich City player of the year by the supporters, in 1973 and 1974. His performances earned him favourable reviews from many quarters, and he later said that one of his managers at Norwich - John Bond - rejected an approach from Manchester United for Keelan's services. After leaving Norwich City, Kevin emigrated to the United States. He signed for the New England Tea Men in 1978 and remained with them until 1980. In 1981, he spent one season with the Rowdies. In an interview for the Norwich City matchday programme on 30th April, 2006, Kevin confirmed that he runs goalkeeping schools in Cape Coral and Tampa Florida and coaches "pretty much every night". He also stated that for 20 years he has worked for a company that manufactures contact lenses and distributes them all over the world, but planned to retire at the end of 2006 to concentrate on his coaching. In 2002, Keelan was made an inaugural member of the Norwich City F.C. Hall of Fame. 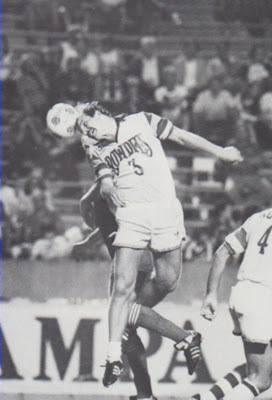 This one shows Tony Towers during his days with the Rowdies in 1984. 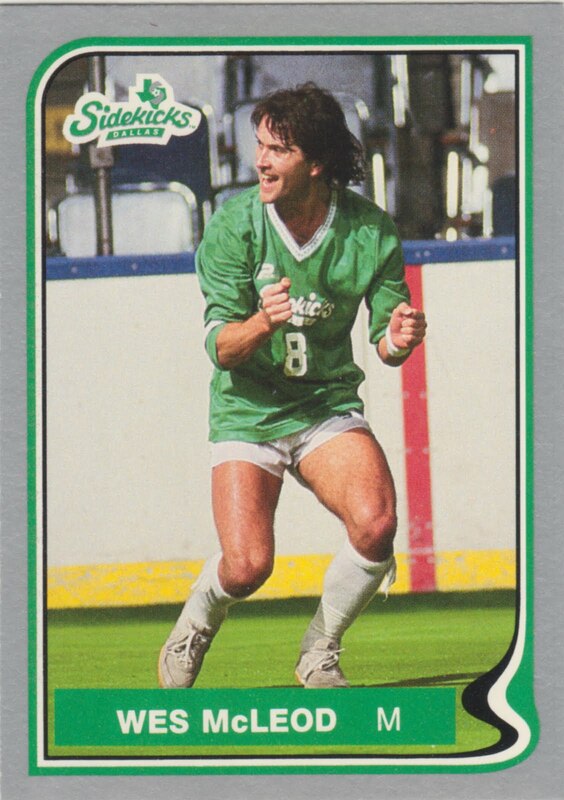 Wes McLeod's 1987-88 MISL card, produced by Pacific Trading Cards, whilst at the Dallas Sidekicks. Glenn "Mooch" Myernick was born December 29th, 1954 in Trenton, New Jersey. Mooch played soccer at Lawrence High School in New Jersey, from which he graduated in 1972. He was All-State as a forward in 1971 and as a defender in 1972. Beginning his freshman year, he led Lawrence to three straight Group 2 state titles. In 1999, he was named by The Star-Ledger as one of the top ten New Jersey high school soccer players of the 1970s. Following high school, he attended a local community college before transferring to Hartwick College his sophomore season. He was a second team All American in 1974, but lost much of the 1975 season with the U.S. Olympic team as it attempted to qualify for the 1976 Summer Olympics. Returning to Hartwick for the 1976 season, Myernick was named team captain and led the Hawks to the NCAA Final Four and first team All American recognition. He was also the 1976 Hermann Trophy winner as the top college player of the year. In 1995, Hartwick College inducted Myernick into its Athletic Hall of Fame. 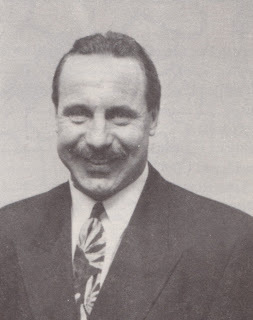 In 1976, Al Miller, a former Hartwick soccer coach who was now head coach of the Dallas Tornado, selected Mooch with the top pick of the NASL College Draft. The Tornado traded Mooch to the Portland Timbers in 1980 and he was named the Timbers captain that season. When Portland folded following the 1982 season, the Rowdies selected him in the dispersal draft. 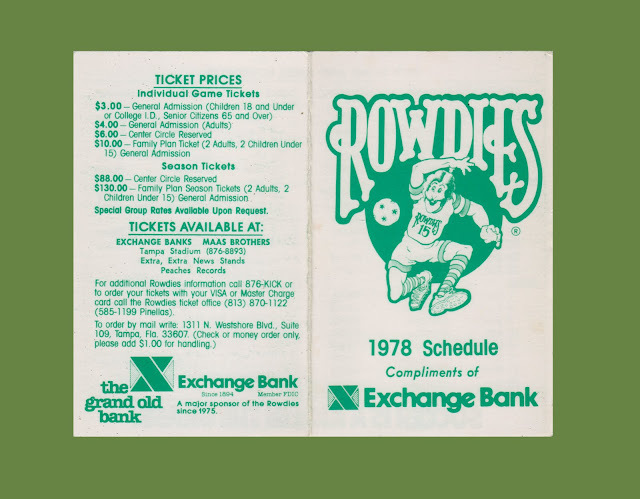 While the NASL folded following the 1984 season, the Rowdies continued to play as an independent team. He remained with the Rowdies before retiring in 1985. 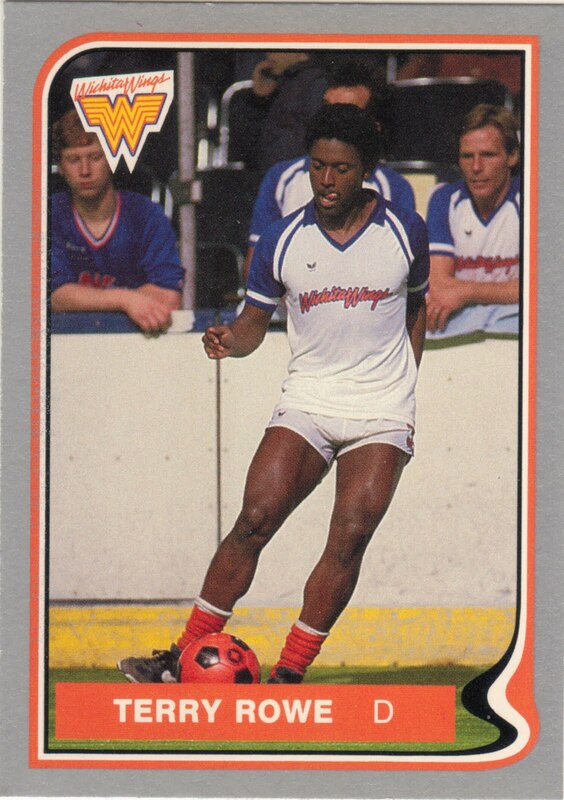 Mooch spent one season, 1979-1980, with the Wichita Wings of Major Indoor Soccer League. He earned 10 caps for the U.S. from 1977 to 1979, serving as team captain in 1978. He also started 4 games for the U.S. Olympic soccer team during Olympic qualifying in 1976. When Mooch retired from playing professionally in 1985, becoming an assistant coach at the University of Tampa. In 1986, he moved back north to Hartwick College to become an assistant coach. 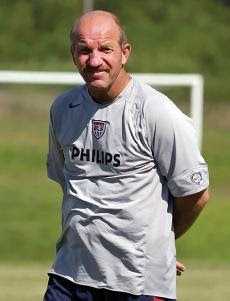 After serving as an assistant coach on the 1996 U.S. Men's Olympic soccer team, Mooch was hired in 2002 to serve as an assistant coach on the Men's National Team for the 2002 FIFA World Cup. After the highly successful Quarterfinal run made by the United States, he coached the U.S. Men's U-23 Soccer team as they attempted (unsuccessfully) to qualify for the 2004 Olympic Tournament. He continued serving the U.S. Men's National Team through the 2005 Gold Cup (notably - managing the team during the championship game, when head coach Bruce Arena had been suspended for the final) and the 2006 FIFA World Cup. He was also the organizer of the Colorado Rapids youth soccer clinic from 1997 through 2000 at the Rapids traning facility in Westminster, Colorado. As a head coach, Mooch served the Colorado Rapids of Major League Soccer from 1997 to 2000 and the U.S. under-23 Men's National Team in 2003. Sadly, Glenn Myernick died in Thornton, Colorado on October 9th, 2006, four days after suffering a heart attack during his morning jog on Thursday, October 5th, 2006, never having regained consciousness. U.S. Soccer officials, including President Sunil Gulati and former Men's National Team manager Bruce Arena, paid homage to Mooch and praised his invaluable contributions to soccer in the United States. Glenn Myernick was acclaimed as an enthusiastic coach, player, father, and friend. He was the US Men's Senior National Team assistant coach at the time of his death. Manic's Marcantonio tries to steal the ball away from Luis Fernando in 1981. Paul Dougherty was born May 12th, 1966 in Leamington Spa, England. Paul began his career when he signed as an apprentice with English First Division club Wolverhampton Wanderers at age 16. He made his league debut while still an apprentice during the 1983/84 season that saw the club lose their top flight status. He made the most appearances of his Wolves career during the following season, which also saw him spend time on loan at Torquay United during February 1985. He failed to establish himself as a regular choice though, and played only sporadically over the next two years as the club continued to slide down the divisions under a succession of managers. At the end of the 1986/87 season, he moved to the U.S. to further his career there, where he would remain employed as a player for the next eighteen years. 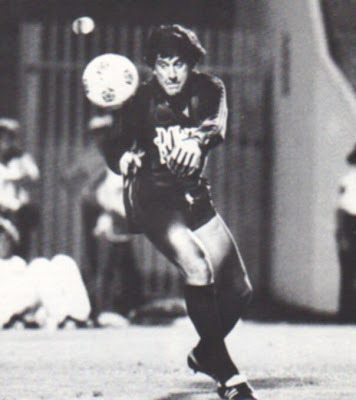 In 1987, Paul signed with the San Diego Sockers of the MISL, later enrolling at San Diego State University. Whereas his lack of height hindered his development as an outdoor player, it served him in good stead in the indoor game which prized quickness and agility over size and stamina. Over the next five years, he earned four titles as the Sockers dominated indoor soccer. In 1989, he was named the “Championship Series Unsung Hero” as the Sockers knocked off the Baltimore Blast for the title. When the Sockers moved to the Continental Indoor Soccer League (CISL) in 1992, He moved as well, to the Buffalo Blizzard of the National Professional Soccer League (NPSL). At the time, the NPSL was the higher paying of the two indoor leagues. He remained with the Blizzard for three seasons, from 1992 to 1996. At the completion of the 1995-1996 NPSL season, he jumped both teams and leagues, moving to the Houston Hotshots of CISL. That season he was the CISL third leading scorer while the Hotshots went to the championship series, only to fall to the Monterrey La Raza. Paul was named All-CISL. The next season, the Hotshots did not go so far in the playoffs, but he led the league in scoring, garnering both All CISL and CISL MVP honors. The CISL folded at the end of the 1997, leading him to move to the MLS. By the time, Paul Dougherty moved to MLS, he was already a veteran of several outdoor U.S. teams. While he made his name with the indoor game, he also was a consistent performer outdoors. 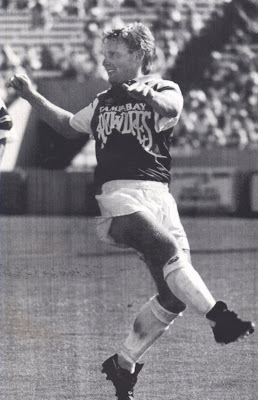 While in San Diego with the Sockers, Dougherty played the 1988 Western Soccer Alliance (WSA) with the San Diego Nomads. Then in 1990, he spent the 1990 outdoor season with the Orlando Lions in the APSL which had been formed that year by the merger of the WSA and east coast American Soccer League. The next season saw him begin with the Miami Freedom of the APSL before moving to the Fort Lauderdale Strikers. While he sat out the 1992 APSL season, instead spending time with two of his indoor clubs, he returned to the APSL in 1993, this time with the Rowdies. That season was one of his best as he bagged eight goals in twenty-two games and a spot on the APSL All Star team. Once again, he took time off from the outdoor game to devote himself to indoor soccer. However, in 1995 he signed with the Montreal Impact of A-League, successor to the APSL. He once again earned All Star honors. After the CISL folded at the end of 1997, he began pursuing full time employment in an outdoor league. On February 3rd, 1998, the MetroStars of the MLS signed him. He played sixteen games that season, before the MetroStars traded him to the Tampa Bay Mutiny for Mike Duhaney in July. He began the 1999 season with the Mutiny but was traded on August 2nd, 1999 with Sam George and a draft pick to the Chicago Fire for Ritchie Kotschau and Manny Lagos. When Paul failed to produce with Chicago, they sent him on loan to the Charleston Battery of the USL First Division. In March 2000, Dougherty was able to add another team to his resume, having been a member of it for only a few hours. The Fire released Dougherty on March 15th, 2000. He was then selected by the New England Revolution the next day in the Waiver Draft. The Revs then turned around and traded him to the Colorado Rapids in exchange for a fifth round pick in the upcoming Super Draft.Paul spent the 2000 season with the Rapids, but failed to score in twenty-four games and on October 31st, 2000 he announced his retirement. Paul didn’t stay retired for long. Kai Haaskivi, a former indoor team mate of his, was coaching the Pittsburgh Riverhounds of the USL A-League. The Riverhounds needed some added offensive production heading into the post season as well as for upcoming Open Cup games. Paul signed with the Riverhounds on July 20th, 2001. Haaskivi’s gamble paid off as Paul provided instant offense, including a goal in the Open Cup quarterfinal match against his old team, the Chicago Fire. At the end of the season the Riverhounds released him and he moved back to San Diego to pursue a coaching career. However, he was unable to call it quits to playing and on February 5th, 2004, he rejoined the San Diego Sockers for one last indoor season. Unfortunately, the magic was gone and the Sockers folded midway through the season. When the Riverhounds released Paul Dougherty, he returned to San Diego where he became an assistant coach with the San Diego Flash of the USL A League. In 2002, he left the Flash and joined the staff of the La Jolla Nomads Soccer Club. This is significant in that he had begun his U.S. outdoor career fourteen years earlier with the Nomads senior team, the San Diego Nomads. In 2004, he took the Nomads U-15 team to the U.S. national championship only to have his boys fall, 5-4, to the Greater Boston Bolts. In addition to coaching with the Nomads, he beame an assistant coach with the UC San Diego men’s team as well as the Manchester Soccer Club and Rancho Santa Fe Attack. This one shows Petar Baralic against the New York Cosmos. 1979 Guest player Tony Want's 1970-71 FKS Publishers card, whilst he was at Tottenham Hotspur. Ken Fogarty was born January 25th, 1955 in Manchester, England. Ken began his professional career with Stockport County at the age of seventeen. He then moved to the United States to play for the Los Angeles Skyhawks of the second American Soccer League in 1976, the year they won the ASL Championship. He returned to England to play for Stockport County until returning to the U.S. in 1979 to play for the Fort Lauderdale Strikers of the NASL. He remained with the Strikers through the end of the 1983 season. When the Strikers moved north to Minnesota, Ken went with the team for the final NASL season in 1984. The NASL folded at the end of that season and the Strikers then jumped to the Major Indoor Soccer League. He continued to play with the Strikers until they folded at the end of the 1987-1988 MISL season. However, in 1988, the Fort Lauderdale Strikers were resurrected, this time playing in the second ASL. Ken joined them for the outdoor season, then moved to the Baltimore Blast of MISL for the next three indoor seasons. In 1989, Fogarty left the Strikers for good and joined the Rowdies of the ASL where he served as a player coach from 1989 to 1993. In 1990, the Rowdies joined the American Professional Soccer League. 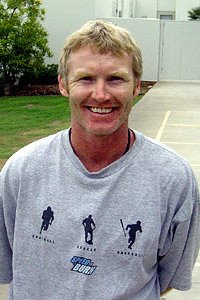 While playing with the Rowdies, Fogarty also served as the team's head coach in 1992 and 1993. In 1993, he was the APSL Coach of the Year. He was Head Coach and Technical Director of the Cayman Islands national team from 1993-1994 and from 1996-1998. The Kansas City Wizards of the Major League Soccer signed Ken as an assistant coach in 1999. On April 15th, 1999, the Kansas City Wizards named him as its interim coach after Ron Newman resigned following an 0-4 start. 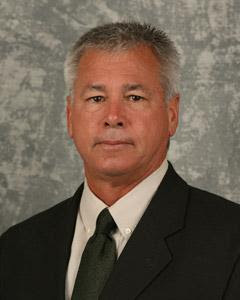 After the team hired Bob Gansler, Ken returned to his position as an assistant coach for the next two seasons. Rodney Marsh battles with Hartford Bicentennials' Charlie McCully in 1976.